LEMUEL Gulliver’s travels are best remembered for Lilliput, Brobdingnag (or Brobdingrag) and Laputa. However, Gulliver also met nasty Dutchmen, and even the Emperor of Japan. Jonathan Swift’s satirical novel Gulliver’s Travels was published in 1726. Swift had been pondering its first ideas already ten years earlier. Jonathan Swift (1667-1745) was born in Dublin, but during his lifetime he moved many times between Ireland and England. He worked mainly as a priest and as a secretary. He also participated in several political controversies of his time; for example, he won many enemies in a dispute about whether ancient playwrights or contemporary writers were more worthy. 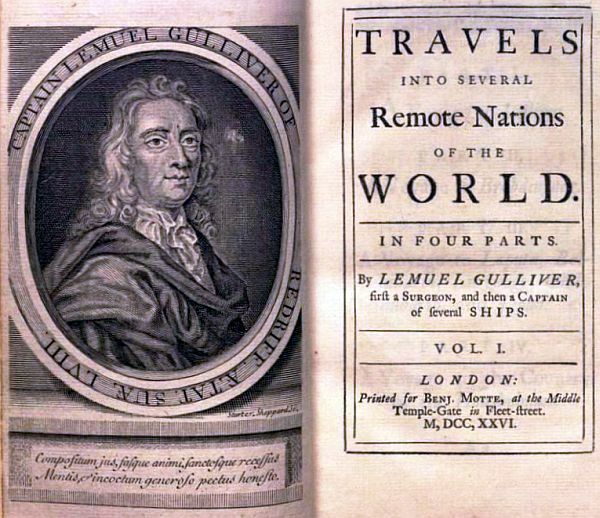 Gulliver’s trip to Japan is sometimes forgotten, because Gulliver’s Travels is often read as an abbreviated version that includes only the first and the second book. They tell ship’s surgeon Lemuel Gulliver’s visits to the lands of the tiny Lilliputians and the giants of Brobdingnag. The brief visit to Japan takes place between the third and the fourth books. After a long and hard trip, Gulliver finally returns home to England via Japan and Netherlands, with the kind help of the king of Luggnagg. In the fourth part Gulliver then takes a new trip to the land of the Houyhnhnms, where horses and people have changed places. ACTUALLY, Japan is the only real island that Gulliver visited on his travels. All others are creations of Swift’s fine imagination. And what was the purpose of that short visit to Japan? Of course, to make fun of the Dutch! For this Japan was the perfect place, since during the Edo period Japan was practically closed for Europeans. The only exception were the Dutch, who had permission to live and do business in a small area in Nagasaki. Although Swift did not show much respect for the policies of the church of England, he was patriotic: the Anglican Church was the only true church, and the Dutch – who were in favor of the freedom of religion – were not Christians at all. Already early in the third book Gulliver mets his first Japanese. His ship was taken by Dutch pirates, and the captain of one Dutch ship happened to be Japanese. The Dutch pirates threw Gulliver in a small canoe with little provision, but the Japanese captain saved his life by giving from his own. “I was sorry to find more mercy in a heathen, than in a brother christian,” Gulliver admitted. Meanwhile the Dutchman, ”standing upon the deck, loaded me with all the curses and injurious terms his language could afford”. Later, Gulliver was saved to the airborne island of Laputa. From there, the journey continued to Balnibarbi and Glubbdubdribb, and finally to Luggnagg. Luggnagg had good trade connections with Japan. Thus Japan was Gulliver’s best hope for a route back to Europe. The king of Luggnagg wrote a letter of recommendation for an audience with the emperor of Japan. To get on a ship to Japan, he would have to lie that he is a Dutchman. Gulliver told exceptionally little about Japan. He only noted that ”my stay in Japan was so short, and I was so entirely a stranger to the language, that I was not qualified to make any inquiries”. Following the advice of the king of Luggnagg, Gulliver lied to the emperor that he was a shipwrecked Dutch seaman, wishing to be conducted in safety to Nangasac (Nagasaki), where he wished to find a Dutch ship to Europe. The long and arduous journey to Nangasac was successful, and Gulliver found his ship. On the Dutch ship, he barely managed to conceal the fact that he had not trampled the crucifix. DUring the voyage from Nangasac to Amsterdam ”nothing happened worth mentioning”. We ”lost only three men by sickness in the voyage, and a fourth, who fell from the foremast into the sea, not far from the coast of Guinea”. Gulliver’s Travels is avalaible on the pages of Project Gutenberg.